A little girl finds an injured reindeer that she believes to be Prancer, a member of Santa's sleigh team. She nurses it back to health and unintentionally revives the Christmas spirit in her entire town. Christmas is all about love, believing in the impossible, and approaching the holidays with the heart of a child. These are also the themes of John D. Hancock's film "Prancer." It is written by Greg Taylor, who has spent a good chunk of his career writing Christmas movies, films like "The Christmas Box," "The Christmas Wish," and "Santa and Pete," among others. The film stars Rebecca Harrell Tickell as Jessica, a young girl who really, truly believes in Christmas and in Santa Claus. She finds an injured reindeer she believes to be the actual Prancer from Santa's sleigh team. She takes it home to her family's farm to nurse it back to health, unbeknownst to her father John, played by Sam Elliot, who is having a few issues of his own as he struggles to keep their farm afloat. When Jessica's secret gets out, it reignites the spirit of Christmas in her entire small town. 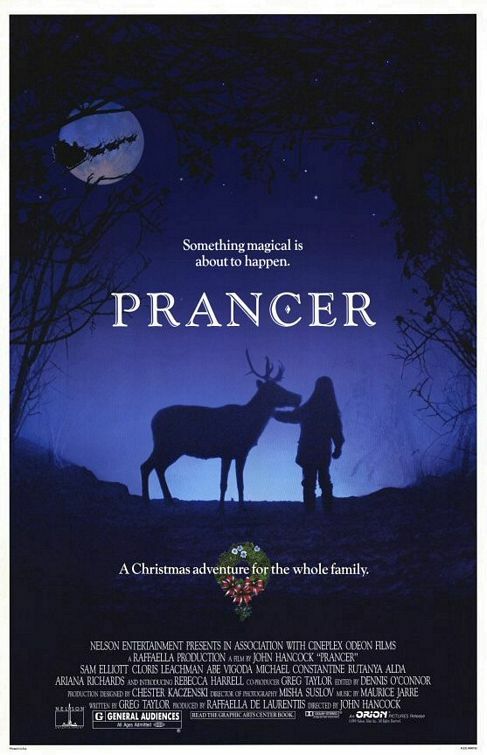 "Prancer" is a film that focuses on the innocence of a child and their faith in Christmas that inspires others. It is a cute family drama that ventures into schmaltzy territory on several occasions. Rebecca Harrell Tickell is adorable enough, though some of the things that are supposed to make her cute and endearing get a little grating and annoying over time, at least to us. Sam Elliott plays a stereotypical Sam Elliott-style role: a gruff cowboy type who doesn't take kindly to emotion because he needs to work to keep his mind off of the tragedy in his life. And speaking of tragedy, what's up with dead parents during Christmas movies? It's so the opposite of everything that's good and Christmasy. But we get it, family and togetherness and appreciation and all that jazz. As these characters go through the story, they are each changed in some way and learn valuable life lessons about love, family, togetherness, and most importantly, the spirit of the season. "Prancer" has a few goofy moments that fit into the family film formula, but it also deals with a few more mature themes as well. The pacing of the movie can be a bit slow and it definitely drags and gets repetitive in a couple of places. It also has some little gags that are charming and made us chuckle. In the end, there is enough Christmas jolly to go around, and "Prancer" can leave you feeling all warm and fuzzy. Any movie that will put you in the proper state of mind at Christmastime is worth a watch during the yuletide season.